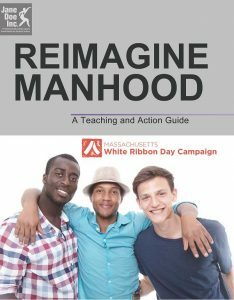 Thank you for your interest in the Massachusetts White Ribbon Day Campaign “Reimagine Manhood” video and discussion guide. Jane Doe Inc. worked with Press Pass TV to produce these materials about the roles men and boys can play promoting healthy masculinities and being part of the solution in ending men’s violence against women and gender based violence. The video shows several relationships where men of all ages and backgrounds can influence one another regarding values, beliefs and behaviors. This teaching and action guide contains a lesson plan for guided discussion over 1 to 3 sessions. Viewers are invited to reimagine manhood in their own lives and communities and to embrace healthy frameworks of living wholeness and truth to themselves. Facilitators are free to adapt or modify this material for the community you serve and to develop your own exercises based on the video. Educators may use this guide in the classroom or in groups to explore ideas of masculinity with young men and talk about ways they can shape their own identities as they move into adulthood. Group leaders may use this guide to engage men in the community to consider what manhood means; where it comes from, and how it affects their lives. These conversations are ideal for father’s groups, men’s support groups, Intimate Partner Abuse Education Programs, and more. White Ribbon Day Ambassadors can use this guide to bring the work of the WRD Campaign into their community at any time. You may organize a gathering of friends or partner with other community groups to view the video and use parts or this entire guide to spark discussion. Use of the Jane Doe Inc. WRD PSA and Teaching and Action Guide is free of charge and open to the public. To learn more about JDI’S Massachusetts White Ribbon Day Campaign and this resource, please explore this website, or contact Jane Doe Inc.
We will ask you to provide your contact information so that we can reach out to you later to learn about your experience with using this guide. We are interested in learning about your experience with using this guide. Please provide your feedback and evaluation comments.